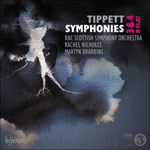 Already Tippett had turned his attention to Symphony No 4, with which he eventually decided to fulfil a 1969 commission from Georg Solti and the Chicago Symphony Orchestra. He had originally planned to produce a setting of Robert Lowell’s poem ‘For the Union Dead’, and Lowell’s line ‘man’s lovely / peculiar power to choose life and die’ resonates in the symphony Tippett in due course chose to write. Back in the 1920s, the composer had been taken to the Dorset Pitt-Rivers museum, where he saw a fast-motion film of a rabbit foetus developing from a single cell. Fifty years later, he used this well-stored memory in the composition of his fourth symphony, which he considered a ‘birth-to-death’ piece, utilizing Colin Davis’s description of Sibelius’s one-movement seventh symphony. The life cycle of Tippett’s symphony, also an unbroken span of music, is punctuated by what the score calls a ‘breathing effect’, ‘gently breathing’ from the depths of the orchestra, a foetus in a womb, or a life on its deathbed, sound and voice reduced to their essence. Breath was in the air during the symphony’s gestation, amplified and unleashed by technological advances: Samuel Beckett’s miniature play Breath (1969) consisted of inhalation and exhalation over a stage strewn with rubbish; the orgasmic breathing of Serge Gainsbourg and Jane Birkin had seen their song Je t’aime … moi non plus banned from the BBC the same year. Symphony No 4 was premiered in October 1977. Solti recalled working on it ‘with the greatest joy and love’ and was astonished that the composer knew ‘every single tone and articulation [and] described with the clearest imagination how things should sound’. But Tippett, who remained ambivalent about the electronic music pioneered by figures such as Boulez or Stockhausen, had only the vaguest ideas as to how the breathing effect should be realized. At the premiere a wind machine was used, which sounded less like breathing and rather more like a wind machine. Subsequent attempts, with a player breathing into a microphone, were horribly reminiscent of blue movies (cue chortles from the composer). Tippett eventually stipulated an electronic tape should be used, with speakers placed in the centre of the orchestra and the recording introduced according to precise markings in the score. 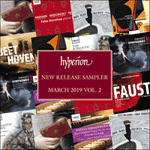 For this release a new audio sample, the first in forty years, has been produced by Ian Dearden of Sound Intermedia, and with a technical finesse impossible in Tippett’s lifetime. ‘It’s all my voice that’s been recorded’, says Dearden, ‘but I wanted to make some kind of journey that made it feel like a younger and an older voice—and I didn’t want it to sound particularly gender-specific.’ Each breathing sequence was recorded separately and, by the end, the pitch was subtly aged and lowered. The symphony was recorded by the orchestra alone, and the breath added in post-production. The symphony’s single movement is split into seven stages: four sections combining the conventions of sonata and symphonic forms (exposition–slow movement–scherzo–recapitulation) are interleaved with three developmental episodes. The orchestration is indebted to Tippett’s concerto for orchestra (1962-3) and darts similarly around the players, not least an inflated brass section with six horns and a second tuba. Blocks of material are juxtaposed side-by-side or on top of each other in often surprising combinations of light and dark, energy and calm. Tippett had become famously obsessed with television, which altered permanently his conception of musical structure: the score feels not so much composed as (in a filmic sense) edited. The borders between each section of the symphony are fluid, and Tippett often employs linking passages as a kind of musical screen wipe: a six-horn pile-up, or a palate-cleansing sorbet of tinkling percussion. At times the music seems to be channel-hopping. The introduction is something of a ‘birth motif’, in which the orchestra breathes in duet with the tape, rocking clarinets and violins marked as ‘heaving’. The main exposition introduces three musical ideas: ‘power’ in the brass, ‘vigour’ in the strings, and ‘lyric grace’ in the woodwind. The first development section flies off into whirling fantasias on the exposition’s original themes; the slow movement is one of haunting solos for the various woodwind leaders wafted over harp and piano. The second development, hammered into the centre of the symphony, becomes a hurtling climax of rasping orchestra, mottled with percussion, gasping for breath (and seemingly haunted by the turbulent final pages of Stravinsky’s Symphony in three movements). Tippett then marks the scherzo ‘light, flying’ and scores it for bubbling woodwind; the section culminates with a spinning fugal paraphrase of a three-part fantasia by Orlando Gibbons, starting for unison violins and, as if one cell were splitting into many, splintering into the whole string section. The third and final development gathers up in its arms all that has gone before, piling up layers of half-remembered motifs, or kaleidoscoping them into one another, a life flashing before one’s eyes. The heavy brass chords of the opening ‘birth motif’ return, as does the breath, but if first it was foetal, newborn, it is now more of a death-rattle. Music of great vitality in the horns and strings is contrasted with a slow dirge for trumpets and tubas. The orchestra fades into nothing and the piece stops breathing. Emerging from the symphony’s UK premiere at the Proms and having dutifully read his programme note, a small boy approached the composer: ‘And did the rabbit die at the end?’ This cautions against too programmatic a reading. The seven sections are not the seven ages of man. But Tippett plays with the idea of how a symphony might be a life, and a life a symphony. Tippett s’intéressait déjà à la Symphonie nº 4, qui devint en fin de compte sa réponse à une commande que lui avaient passée en 1969 Georg Solti et le Chicago Symphony Orchestra. À l’origine, il voulait mettre en musique le poème de Robert Lowell «For the Union Dead» («Pour les morts de l’Union»), et le vers de Lowell «man’s lovely / peculiar power to choose life and die» («Ce fascinant pouvoir qu’à l’homme de choisir la vie et puis mourir») trouve un écho dans la symphonie que Tippett décida d’écrire en temps voulu. Dans les années 1920, le compositeur avait été visiter le Pitt-Rivers Museum, dans le Dorset, où il vit un film en accéléré d’un fœtus de lapin se développant à partir d’une seule cellule. Cinquante ans plus tard, il utilisa ce souvenir bien mémorisé dans la composition de sa quatrième symphonie, qu’il considérait comme un cycle allant «de la naissance à la mort», pour reprendre la description que fit Colin Davis de la septième symphonie en un seul mouvement de Sibelius. Le cycle de vie de la symphonie de Tippett, également une musique ininterrompue, est ponctué par ce que la partition appelle un «effet de respiration», «en respirant doucement» du plus profond de l’orchestre, un fœtus dans le ventre de sa mère, ou une vie sur son lit de mort, le son et la voix réduits à leur essence. Le souffle était dans l’air du temps au moment de la gestation de cette symphonie, amplifié et déclenché par les avancées technologiques: la pièce miniature de Samuel Beckett Breath (Souffle, 1969) consistait à inhaler et exhaler sur une scène jonchée de détritus; à cause de leur respiration orgasmique, la chanson Je t’aime … moi non plus de Serge Gainsbourg et Jane Birkin avait été interdite à la BBC la même année. La Symphonie nº 4 fut créée en octobre 1977. Solti se souvint y avoir travaillé «avec le plus grand bonheur et amour» et s’étonnait que le compositeur connaisse «tous les sons et articulations [et] décrive avec une imagination très claire comment les choses devaient sonner». Mais Tippett, qui avait une attitude ambivalente à l’égard de la musique électronique élaborée par des personnalités telles Boulez ou Stockhausen, n’avait que des idées très vagues sur la manière dont pourrait être réalisé l’effet de souffle. À la première exécution, on utilisa une machine à vent, qui sonnait moins comme un souffle que comme une machine à vent. Les tentatives ultérieures, avec un instrumentiste soufflant dans un microphone rappelaient affreusement les films pornographiques (signes de gloussements du compositeur). Tippett finit par stipuler qu’on utilise une bande magnétique enregistrée, avec des enceintes placées au milieu de l’orchestre et en déclenchant l’enregistrement selon des indications très précises qui figurent dans la partition. Pour le présent enregistrement, un nouvel échantillon sonore, le premier en quarante ans, a été réalisé par Ian Dearden de Sound Intermedia, avec une finesse technique impensable à l’époque de Tippett. «Ce n’est que ma voix qui a été enregistrée, dit Dearden, mais je voulais faire une sorte de voyage qui donne l’impression d’une voix plus jeune et d’une voix plus âgée—et je ne voulais pas qu’elle corresponde particulièrement à un sexe ou à l’autre.» Chaque séquence de respiration a été enregistrée séparément et, à la fin, la hauteur de la voix a été discrètement vieillie et abaissée. Cette symphonie a été enregistrée par l’orchestre seul, et le souffle ajouté au mixage. L’unique mouvement de la symphonie est scindé en sept sections: quatre d’entre elles allient les conventions de la forme sonate et de la forme symphonique (exposition–mouvement lent–scherzo–réexposition) et trois épisodes de développement viennent s’intercaler entre elles. L’orchestration s’inscrit dans la mouvance du concerto pour orchestre (1962-63) de Tippett et jongle de la même façon entre les groupes instrumentaux, en particulier un pupitre de cuivres gonflé avec six cors et un second tuba. Des blocs de matériel sont juxtaposés côte-à-côte ou les uns sur les autres dans des combinaisons souvent surprenantes de lumière et de pénombre, d’énergie et de calme. Tippett était connu pour son obsession pour la télévision, ce qui modifia durablement sa conception de la structure musicale: la partition n’a pas tant l’air composée que montée (au sens cinématographique du terme). Les frontières entre chaque section de la symphonie sont vagues, et Tippett emploie souvent des transitions qui font penser à des lave-glaces musicaux: un carambolage de six cors ou un tintement de percussions comparable à un trou normand. Parfois la musique semble faire du zapping. L’introduction est une sorte de «motif de naissance», où l’orchestre respire en duo avec la bande sonore; les clarinettes se balancent et les violons sont marqués «tanguant». L’exposition principale introduit trois idées musicales: «puissance» aux cuivres, «vigueur» aux cordes et «grâce lyrique» aux bois. Le premier développement s’envole dans des fantaisies tourbillonnantes sur les thèmes originaux de l’exposition; le mouvement lent comporte des solos envoûtants pour les divers solistes des bois flottant sur la harpe et le piano. Le deuxième développement, martelé au milieu de la symphonie, devient un sommet précipité d’orchestre grinçant, marbré de percussion, haletant (et apparemment hanté par les dernières pages turbulentes de la Symphonie en trois mouvements de Stravinski). Tippett marque ensuite le scherzo «léger, aérien» et le confie à des bois trépidants; cette section culmine en une tournoyante paraphrase fuguée d’une fantaisie à trois parties d’Orlando Gibbons, qui débute par les violons à l’unisson et, comme si une cellule se scindait en de nombreuses autres, se fragmente dans l’ensemble du pupitre des cordes. Le troisième et dernier développement reprend tout ce qui s’est passé auparavant, accumulant des couches de motifs à moitié mémorisés, ou les faisant se télescoper les uns les autres, une vie qui défile sous nos yeux. Les lourds accords des cuivres du «motif de naissance» initial reviennent, tout comme le souffle, mais si, au départ, c’était fœtal, néonatal, il s’agit maintenant davantage d’un râle d’agonie. Une musique d’une grande vitalité aux cors et aux cordes contraste avec un lent hymne funèbre pour trompettes et tubas. L’orchestre s’éteint et la pièce cesse de respirer. À l’issue de la première exécution britannique de cette symphonie aux Proms, un petit garçon qui avait consciencieusement lu son programme, aborda le compositeur: «Et est-ce que le lapin est mort à la fin?». Voilà qui met en garde contre une lecture trop programmatique. Les sept sections ne sont pas les sept âges de la vie humaine. Mais Tippett joue avec l’idée de la manière dont une symphonie pourrait être une vie, et une vie une symphonie. Tippett hatte seine Aufmerksamkeit bereits der Sinfonie Nr. 4 zugewandt, mit der er schließlich einem Auftrag von Georg Solti und dem Chicago Symphony Orchestra von 1969 nachkam. Ursprünglich hatte er geplant, Robert Lowells Gedicht „For the Union Dead“ zu vertonen, und die Zeile Lowells „man’s lovely / peculiar power to choose life and die“ („die schöne und eigenartige Fähigkeit des Menschen, das Leben zu wählen und zu sterben“) schwingt in der Sinfonie mit, die Tippett schließlich komponierte. Bereits in den 1920er Jahren hatte der Komponist das Pitt-Rivers-Museum in Dorset besucht, wo er in einem Zeitraffer-Film die Entwicklung eines Kaninchen-Fötus aus einer einzelnen Zelle sah. Fünfzig Jahre später verwertete er diese sorgfältig abgespeicherte Erinnerung bei der Komposition seiner vierten Sinfonie, die er als ein „Von-der-Geburt-bis-zum-Tod“-Stück betrachtete, wobei er sich der Beschreibung der einsätzigen siebten Sinfonie von Sibelius bediente, die Colin Davis formuliert hatte. Der Lebenszyklus der Sinfonie von Tippett, ebenfalls ein ununterbrochenes Musikstück, ist durchdrungen von dem in der Partitur so genannten „Atemeffekt“, wobei aus den Tiefen der Orchesters „sanft geatmet“ wird—wie ein Fötus im Mutterleib oder ein Leben kurz vor dem Tod, wenn Klang und Stimme auf den Kern reduziert sind. Während der Entstehung der Sinfonie lag das Konzept des Atmens in der Luft, was zudem durch technische Fortschritte erweitert und entfesselt wurde: Samuel Becketts minimalistisches Stück Breath (Atem) von 1969 bestand darin, dass auf einer von Müll übersäten Bühne ein- und ausgeatmet wurde; das orgastische Atmen und Hauchen von Serge Gainsbourg und Jane Birkin in ihrem Lied Je t’aime … moi non plus wurde im selben Jahr von der BBC verboten. Die Sinfonie Nr. 4 wurde im Oktober 1977 uraufgeführt. Solti erinnerte sich daran, dass er „mit höchster Freude und Liebe“ daran gearbeitet habe und dass er erstaunt gewesen war, dass der Komponist „jeden Ton und dessen Artikulation kannte“, die er „mit der deutlichsten Phantasie“ beschrieb. Tippett stand jedoch der elektronischen Musik, die von Kollegen wie Boulez oder Stockhausen erforscht wurde, kritisch gegenüber und hatte nur sehr vage Vorstellungen, wie der Atemeffekt realisiert werden sollte. Bei der Premiere wurde eine Windmaschine verwendet, die allerdings weniger nach Atem, sondern mehr wie eine Windmaschine klang. Weitere Anläufe, so etwa ein Musiker, der in ein Mikrophon hineinatmete, erinnerten eher an Pornofilme (was wiederum für Heiterkeit beim Komponisten sorgte). Tippett legte schließlich fest, dass ein Tonband verwendet werden sollte, wobei Lautsprecher im Orchester aufzustellen und die Aufnahme gemäß genauer Anweisungen in der Partitur abzuspielen seien. Für die vorliegende Einspielung hat Ian Dearden von Sound Intermedia eine neue Hörprobe produziert—die erste seit vierzig Jahren—und zwar von derartiger technischer Finesse, wie sie zu Tippetts Lebzeiten nicht erreicht werden konnte. „Nur meine Stimme wurde eingespielt“, erklärt Dearden, „aber ich wollte eine Art Entwicklung darstellen, so dass man eine jüngere und eine ältere Stimme hört—und ich wollte nichts Geschlechtsspezifisches.“ Jede Atemsequenz wurde einzeln aufgenommen und schließlich ließ man die Tonhöhe fast unmerklich altern und senkte sie ab. Die Sinfonie wurde allein vom Orchester eingespielt und der Atem in der Nachbearbeitung hinzugefügt. Der einzelne Satz der Sinfonie teilt sich in sieben Stadien: vier Abschnitte, die entsprechend der Konventionen der Sonatenform angelegt sind (Exposition–langsamer Satz–Scherzo–Reprise), sind mit drei Durchführungsepisoden verschränkt. Die Besetzung ist an Tippetts Konzert für Orchester (1962-63) orientiert und flitzt in ähnlicher Weise unter den Instrumenten herum, nicht zuletzt der vergrößerten Blechbläsergruppe mit sechs Hörnern und einer zweiten Tuba. Kontrastierende Materialblöcke stehen neben- oder aufeinander in oft überraschenden Kombinationen von hell und dunkel oder Energie und Ruhe. Tippett hatte bekanntermaßen ein großes Interesse für das Fernsehen entwickelt, wodurch sich seine Vorstellung von musikalischer Struktur nachhaltig änderte: die Partitur wirkt nicht so sehr komponiert als vielmehr, im filmischen Sinne, zusammengeschnitten. Die Grenzen zwischen den Abschnitten der Sinfonie sind fließend und Tippett macht oft Gebrauch von Übergangspassagen als einer Art Scheibenreiniger: eine Karambolage von sechs Hörnern oder ein gaumenreinigendes Sorbet in Form klingelnden Schlagzeugs. Zuweilen scheint die Musik wiederholt umzuschalten. Die Einleitung ist eine Art „Geburtsmotiv“, wo das Orchester zusammen mit dem Band atmet und die Klarinetten und Geigen mit „keuchend“ überschrieben sind. Die Hauptexposition führt drei musikalische Ideen ein: „Kraft“ in den Blechbläsern, „Vitalität“ in den Streichern und „lyrische Anmut“ in den Holzbläsern. Die erste Durchführung geht in wirbelnde Fantasien über die Originalthemen der Exposition über; der langsame Satz hat mehrere eindringliche Solos für die verschiedenen Solisten der Holzbläsergruppe, die über Harfe und Klavier schweben. Die zweite Durchführung, die in das Zentrum der Sinfonie gehämmert ist, wird zu dem rasenden Höhepunkt eines schnarrenden Orchesters, versehen mit Sprenkeln des Schlagzeugs, das um Atem ringt (und offenbar von dem turbulenten Schluss der Sinfonie in drei Sätzen von Strawinsky gepeinigt wird). Tippett bezeichnet dann das Scherzo als „leicht, fliegend“ und instrumentiert es für sprudelnde Holzbläser; der Abschnitt kulminiert in einer wirbelnden fugalen Paraphrase einer dreistimmigen Fantasia von Orlando Gibbons, die mit Unisono-Violinen beginnt und dann, als teile sich eine Zelle in mehrere, von dem gesamten Streicherapparat weitergeführt wird. In der dritten und letzten Durchführung wird alles Vorangegangene zusammengetragen, Motivfetzen werden aufgeschichtet oder ineinander verschränkt—ein Leben rast an den Augen des Publikums vorbei. Die gewichtigen Blechakkorde des „Geburtsmotivs“ vom Beginn kehren zurück, und so auch das Atmen, doch wenn dies zunächst von einem Fötus oder Neugeborenen kam, so klingt es jetzt eher wie Todesröcheln. Äußerst vital klingende Musik der Hörner und Streicher wird einem langsamen Klagelied für Trompeten und Tuben gegenübergestellt. Das Orchester entschwindet ins Nichts und das Stück hört auf zu atmen. Nach der britischen Premiere bei den Proms und nachdem er gewissenhaft sein Programmheft gelesen hatte, wandte sich ein kleiner Junge an den Komponisten: „Und ist das Kaninchen am Ende gestorben?“ Damit sei vor einer allzu programmatischen Interpretation gewarnt. Die sieben Abschnitte repräsentieren nicht die sieben Lebensalter des Menschen. Doch spielt Tippett mit der Idee, dass eine Sinfonie ein Leben sein könnte, und ein Leben eine Sinfonie.